Tips for growing and Harvesting French Tarragon. *Sometimes referred to as “a chef’s best friend”. *A perennial herb with long, light green leaves and tiny greenish or yellowish white flowers. For cooking use French tarragon. Russian tarragon has flavor vastly inferior to French tarragon. *French tarragon grows best in warm, dry, well-aerated soils and does not tolerate wet or saturated soils. Before planting, incorporate 1 to 2 inches of well-composted organic matter into the soil. Work the compost into the top 6 to 8 inches of the soil. Organic matter additions to soils help improve aeration and water drainage. *You can’t grow French tarragon from seeds so plant transplants in well-drained soil about 2 to 3 feet apart in order to give each plant room to grow. A full-grown plant should cover about 12 inches of soil and reach 24 to 36 inches in height. 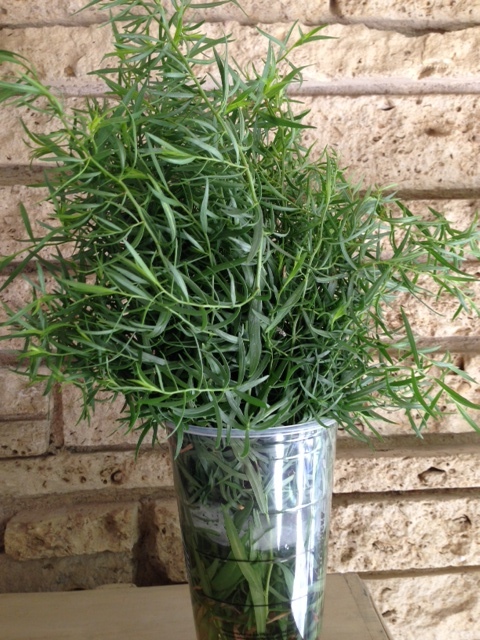 *French tarragon prefers full sun and warm but not hot temperatures. In areas where summer temperatures exceed 90 degrees F, (our Zone 8) partial shading of French tarragon increases plant survival. *French tarragon should be renovated every 2 to 3 years to maintain flavor and vigorous growth. *Mulch around the plants to retain moisture near the soil surface, since tarragon has shallow roots. *French tarragon is generally used as a fresh herb and sprigs may be harvested as needed throughout the growing season. A sprig is typically one-third the length of the stem. *When growing tarragon as a perennial, which we do at the demonstration garden, shear plants to the ground after frost has killed top growth and mulch heavily before winter to ensure survival. *To help keep your plants healthy, divide them every 3 to 4 years in the spring or fall. New plants can grow from stem cutting or root cuttings. *French tarragon is a source of calcium, niacin, potassium, thiamine, and Vitamin A. Posted in Herbs To Grow In Dallas and tagged French Tarragon, Herbs to Grow and Use in Dallas. Bookmark the permalink. Before Christmas, the poem says, young children dream of sugarplums. Our Linda must have visions of gingham checks. At the May 22 Master Gardener meeting, red gingham ribbon tied white picnic lunch boxes topped with blue gingham bordered menus, nestled by larger red gingham napkins. 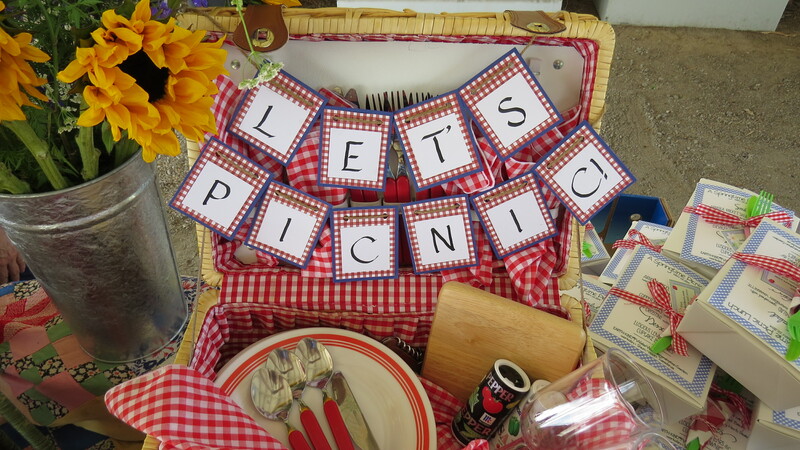 Picnic tables were piled high with gingham quilts and vintage picnic baskets. An open picnic basket crowned the decorations, all ready for a party and filled—you guessed it—with red gingham napkins and red and white plates. Master Gardeners visiting the Demonstration Garden were in for a treat. Our Annette pulled out all her teacher skills and fascinated us with the world of earthworms. How-to’s were flying right and left: we learned how to raise little wigglies in the laundry room, what to feed them, and how to sift out worm castings. 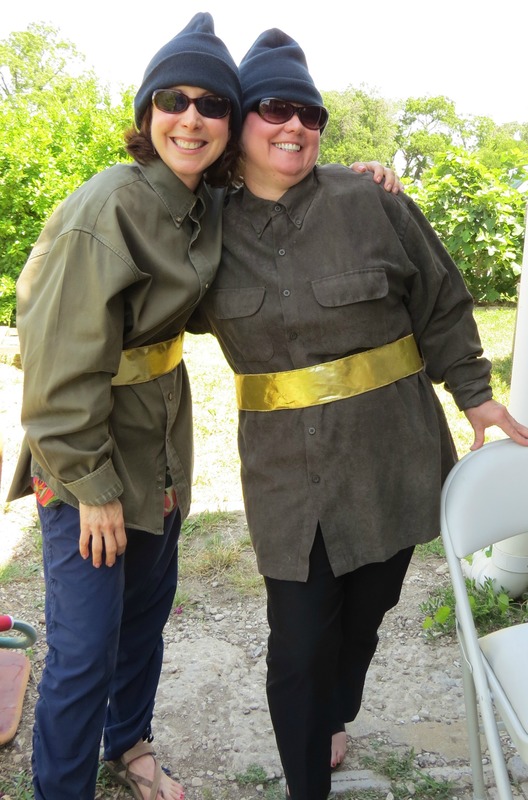 Sue and Michelle signed autographs after their unforgettable demonstration of how worms get close and friendly. 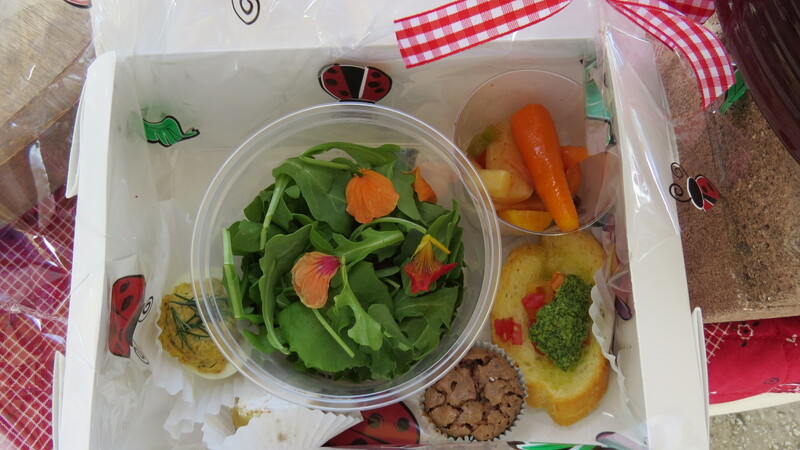 Guests opened their picnic lunches to find a carefully packed feast wrapped in ladybug cellophane. 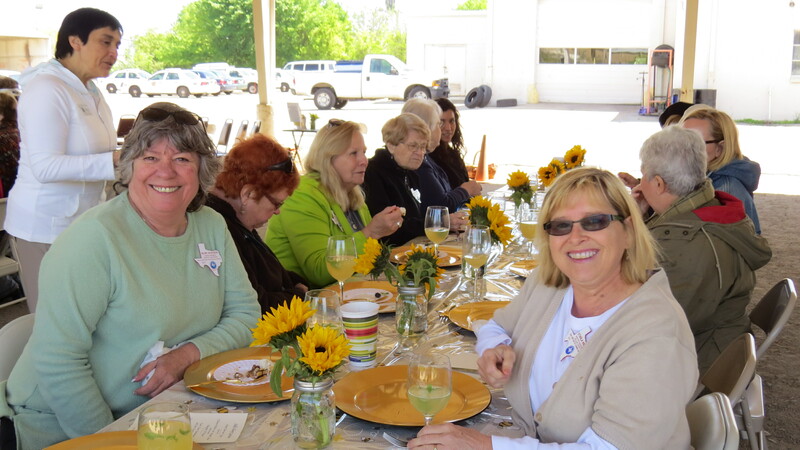 They enjoyed Arugula Rocket Salad with Nasturtium blossoms and Raspberry Vinaigrette, Copper Pennies, deviled eggs with candied bacon, crostini with Every Herb Pesto, Lemon Bars and Cupcake Brownies. What a picture perfect day for a picnic. Come back soon, fellow Master Gardeners! 1. Using a wooden spoon, push raspberries through a handheld wire strainer to puree. 2. In a medium bowl, whisk together 2 tablespoons raspberry puree, lemon juice, vinegar, and sugar. 3. In a slow but steady stream, whisk in olive oil until emulsified. Season with salt and pepper. 2. In a small bowl, mix together the brown sugar, a pinch of cayenne and the cinnamon. Place the bacon on a wire rack set over a rimmed baking sheet. Sprinkle each slice of bacon with some of the spiced sugar and bake, about 10 minutes. Flip the bacon, sprinkle with the remaining spiced sugar and continue to cook until crispy, about 20 more minutes. Remove the bacon from the oven and allow to cool. When the bacon is cool, mince it and set aside, reserving a quarter of it for garnishing the eggs. 2. Put the cold eggs in the bottom of a medium sauce pan and cover with cold water. Bring water to a boil and remove the pan from the heat. Cover the pan with a lid and let stand for 12 minutes. Drain the eggs and rinse with cold water. Let the eggs cool a bit and then peel when they are still warm (eggs are much easier to peel when they are warm). After they are peeled, you can then store them covered, in the fridge. 3. Mix together the mayonnaise, mustard, dill, cider vinegar, Worcestershire sauce, ¼ teaspoon cayenne, the scallions and the minced bacon in a medium mixing bowl. Season with the salt. 4. 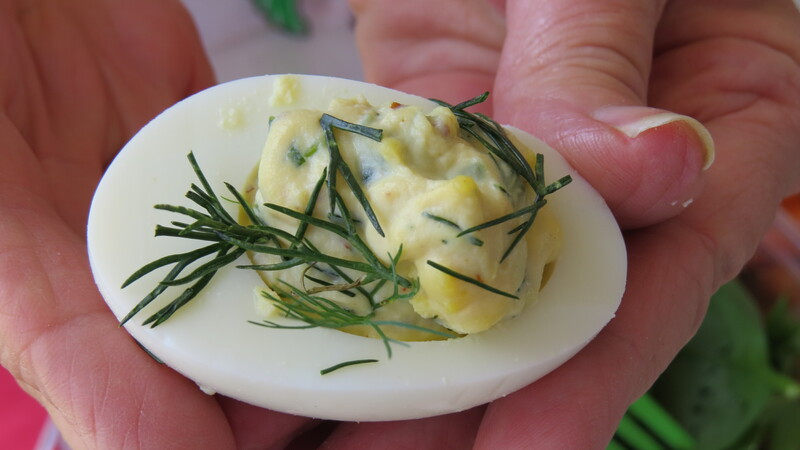 Slice the eggs in half lengthwise. Gently remove the yolks by pressing your thumb against the back of the yolk to pop it out of the white. Add the yolk to the bowl with the mayonnaise mixture. Mash together, using a fork, until smooth. 5. Put the filling in a re-sealable bag. Cut one end off and pipe the filling into the egg whites. Sprinkle with the paprika, extra bacon bits and dill before serving. For any kind of summer backyard gathering, Grandmother always served these. 1. Simmer carrots in water to cover for 5 to 7 minutes or until crisp tender. 2. Drain into a large strainer. 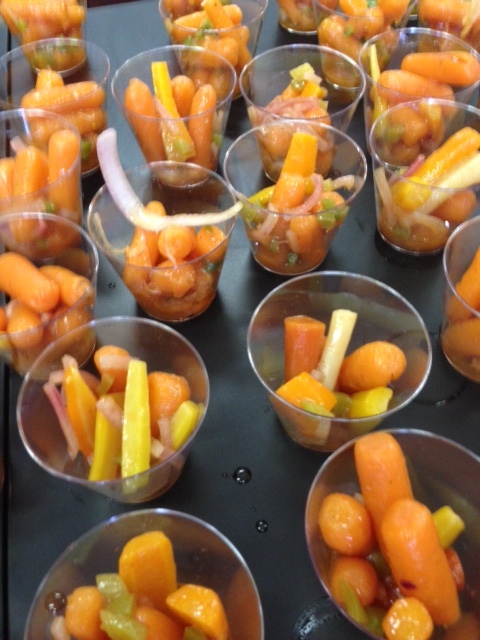 Immerse strainer in ice water to cover carrots. 3. Drain briefly then remove to a large bowl. 4. Combine first seven ingredients and pour over carrots. 5. Add sliced onion rings, green pepper and tomato soup. 1. Blend the almonds and garlic in a food processor until fine. Add the spinach, cheese, herbs, lemon zest and lemon juice to the food processor. Blend the herbs just enough so they are mixed, about 3 seconds. Add the canola oil and olive oil while the food processor is on a low setting. Season with salt and pepper. Blend to desired consistency. 2. Transfer the pesto to a serving bowl. Place the chopped tomatoes on top of the crostini if using and top with pesto. Any leftover pesto should be placed in a bowl and covered with plastic wrap. Press the plastic wrap right on top of the pesto and refrigerate. Position a rack in the center of the oven. Preheat the oven to 325°. Line a 13 x 9-inch baking pan with a sling made of parchment paper or foil. Pulse until the mixture resembles coarse sand. Pour the crust mixture into the pan and press to an even thickness with the bottom of a measuring cup. Bake until golden brown, 20 to 30 minutes. Set aside to cool slightly. Reduce the oven temperature to 300° F.
Pour the batter over the baked crust. Bake until set, about 35 minutes. Remove the pan to a rack to cool completely before cutting into bars. 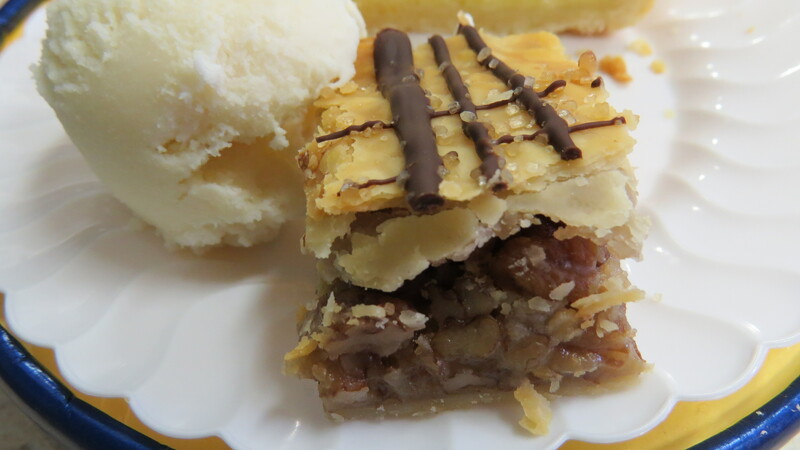 A “go to” recipe for chocolate lovers! 1. Melt butter and chocolate together in a fairly large pan. Remove pan from stove and let mixture cool a few minutes. Add remainder of ingredients and mix together by hand. 2. Spoon batter into foil-lined cupcake pans (use either regular-sized pans or the mini cupcake pans – just be sure to use the foil cupcake pan liners). Fill cups ½ full. 3. Bake at 325 degrees F for about 20 to 30 minutes (adjusting time if using mini pans). Let cool. 4. If desired, spread a little of your favorite chocolate confectioners’ sugar frosting on each cupcake. 5. May be wrapped well and frozen. Yield: About 2 dozen regular size brownies, or 3 ½ to 4 dozen mini brownies. 1. Combine 3 cups blackberries and sugar in large container. Crush blackberries with wooden spoon. Add chopped mint and baking soda. Set aside. 2. Pour 4 cups boiling water over tea bags; cover and let stand 3 minutes. Discard tea bags. 3. Pour tea over blackberry mixture; let stand at room temperature 1 hour. Pour tea through a wire-mesh strainer into a large pitcher, discarding solids. Add 2 ½ cups cold water, stirring until sugar dissolves. Cover and chill until ready to serve. Garnish, if desired. Posted in Herbs To Grow In Dallas, Recipe and tagged Blackberries, Dallas County Master Gardeners, garden recipe, Herbs to Grow and Use in Dallas, vegetable gardening. Bookmark the permalink. Honey cake is traditionally served during Rosh Hashanah, the Jewish New Year celebration, when honey symbolizes the sweetness of the year to come. Put a rack in the middle of oven and preheat oven to 350 degrees F. Oil a 9×5-inch loaf pan well and dust with flour, knocking out excess. Whisk together flour, baking soda, baking powder, salt, cinnamon, and ginger in a medium bowl. Whisk together honey, oil, and coffee in another bowl until well combined. Beat together eggs and brown sugar in a large bowl with an electric mixer at high speed for 3 minutes. Reduce speed to low, add honey mixture and apple juice, and mix until blended, about 1 minute. Add flour mixture and mix until just combined. Finish mixing batter with a rubber spatula, scraping bottom of bowl (batter will be thin). Pour batter into loaf pan and bake for 30 minutes. Cover loosely with foil and continue to bake until cake begins to pull away from sides of pan and a wooden pick or skewer inserted in center comes out clean, about 30 minutes more. Cool on a rack for 1 hour. 1. Combine the water, lemon juice, and honey in a large pitcher and stir to dissolve the honey. 2. Add the ice cubes and stir to combine. Taste and add more lemon or honey, if needed. 3. Add the lemon slices and lavender, lemon verbena, or mint. 1. Preheat oven to 350 degrees F. Grease a 9” x 5” x 3” loaf pan. Line the bottom of the pan with parchment paper. Set aside. 2. In a medium bowl, whisk together the flour, sugar, baking powder and salt. 3. Using a wooden spoon, stir the beer and honey into the dry ingredients until just mixed. 4. Pour half the melted butter into the loaf pan. Spoon the batter into the pan then pour the remainder of the butter of top. Use a pastry brush to spread it around. 5. Bake for 50 to 60 minutes or until top is golden brown and a toothpick/knife inserted in the middle comes out clean. 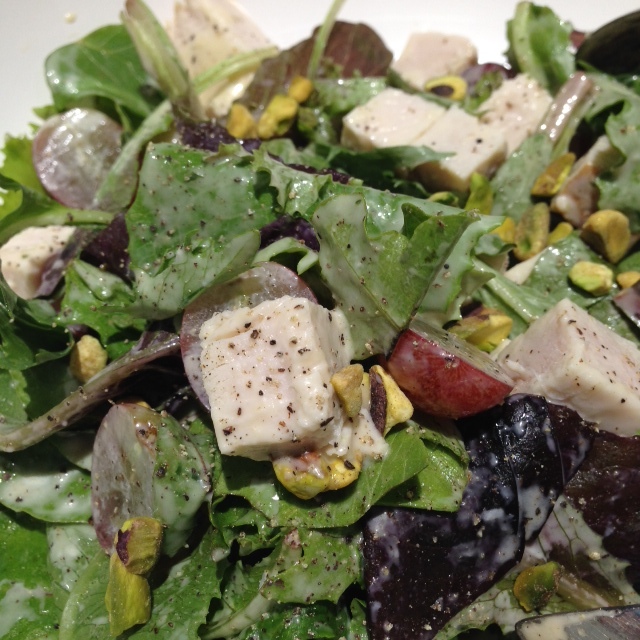 Chef Jerry Traunfeld, author of The Herbal Kitchen, says that each year he counts the days to cherry season, because he can’t wait to put this dish on the menu at The Herbfarm Restaurant in Washington. Tart cherries, also called sour or pie cherries, are a very different fruit from sweet cherries, such as Bings. Raw, they have a pucker-your-mouth sour flavor, but when cooked and sweetened they have the bright intense cherry pie flavor that sweet cherries can never express. 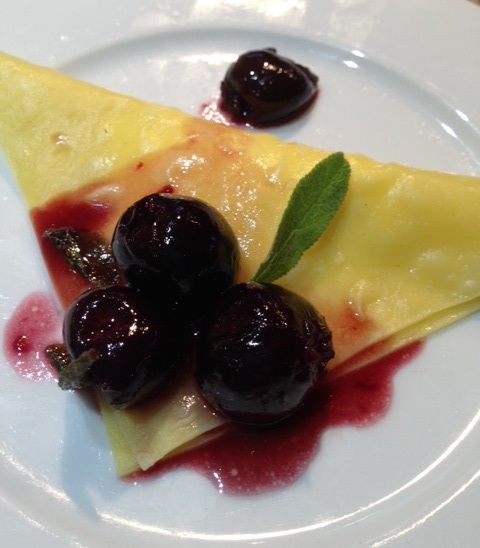 You can make this dish with sweet cherries, but the taste will be quite different. You might have to search a little for fresh tart cherries and fresh pasta sheets. We finally found tart cherries in the frozen food section at Central Market after several repeat trips. As for the fresh pasta sheets, they can be found in most groceries in the refrigerated section with other fresh pastas and labeled lasagna sheets. Be encouraged, your searching will reward you. This is a lovely dish that can be offered as the beginning of a multicourse dinner or romantic supper or the main dish for a special luncheon or brunch. 1. Heat oven to 150 degrees F or its lowest temperature, then turn it off. Crumble the goat cheese into a small bowl, stir in the ricotta, and put it in the oven to warm. 2. Put the hot water and ½ tablespoon of the butter in a glass pie plate or shallow baking dish and place it in the oven also (this is for holding the pasta once it’s cooked). Bring a large pot of salted water to a boil. 3. Melt 1 tablespoon of the butter with the sage leaves in a medium skillet over medium heat and stir until the sage leaves wilt, then turn a darker green color, about 2 minutes. Add the cherries, honey and salt, and toss them over the heat until the cherry skins pop and they release a small amount of juice, about 3 minutes. Add the remaining 2 tablespoon butter to the pan and stir, still over the heat, until it melts and incorporates into the sauce. Remove the pan from the heat. 4. Boil the pasta squares until they are tender but firm, usually 2 to 3 minutes. Lift them out of the water with a skimmer and slip them into the warm water and butter in the pie plate. 5. For assembly: Lift 4 of the pasta squares from the dish and lay them out on a piece of parchment paper or on a baking sheet (this is easy to do with your hands if you wear disposable latex gloves). Spread a tablespoon of the warm goat cheese in the center of each square and fold them in half on the diagonal. Transfer the triangles in pairs to warm dinner plates. Fill the second batch of pasta squares the same way. Spoon the cherries and sauce over the handkerchiefs and serve right away. For the Hello! Honey luncheon, this dressing was served with a salad of organic mixed field greens, Jennie-O Sun-Dried Tomato Smoked Turkey Breast cubed, Grape halves and Pistachios. 1. In a large bowl mix all ingredients together until smooth and creamy. Refrigerate for a few hours before serving. 1. Place a small roasting pan in oven. Preheat oven and pan to 500 degrees. 3. Stir together olive oil and 1 tablespoon butter in preheated pan. Add carrots, salt, and pepper; toss to coat. Bake 10 minutes. 4. Meanwhile, melt remaining 2 tablespoons butter in a small saucepan over medium-high heat. Add shallot; sauté 1 minute. Remove from heat, and stir in bourbon and next 2 ingredients. Return to heat, and bring to a boil, stirring occasionally. Reduce heat to medium, and cook 5 minutes or until mixture is syrupy. Note: Substitute apple juice for bourbon, if you prefer. Look for bunches of carrots that are all about the same size so they’ll cook evenly. 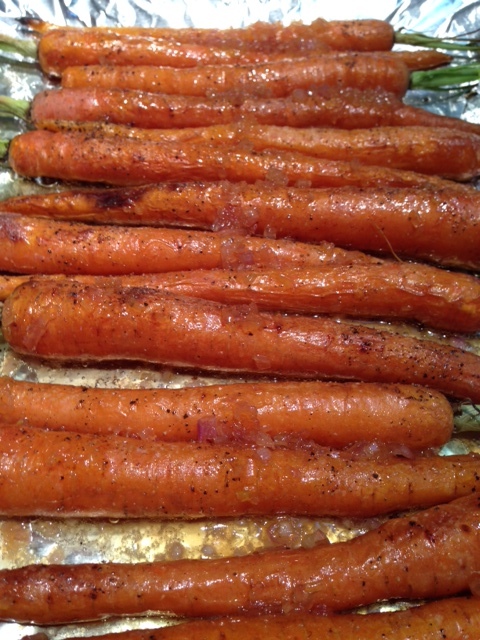 If some are too big-or if you can’t find real (sometimes labeled French) baby carrots-just peel the bigger ones and halve them lengthwise before roasting. In a bowl, combine butter, flour, powdered sugar and almonds. Sablage the mixture, cutting the butter into the flour using your fingers until it is a sandy consistency. Add the egg and stir with one finger. Turn out on the counter. Fraisage two to three times, until dough just comes together by using the palm of your hand to smear the dough across the counter. Flatten it out on a parchment-lined sheet. Chill. Form the dough into the tart shell. In a saucepan, melt pieces of butter. In a bowl, whisk the remaining ingredients. Pour the egg mixture through a fine sieve to remove chalise. Add the butter and whisk rapidly. Fill the tart shells to about ¾ full. Bake at 180°C(360-365°F) for about 30 minutes, or until the top looks like a Crème Brûlée after it’s been torched. 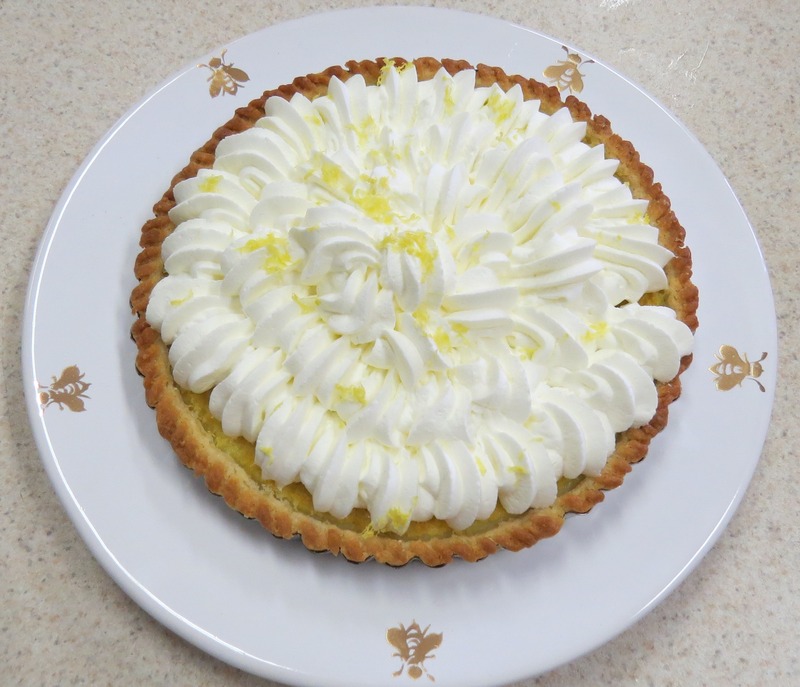 Decorate cooled tart with an abundance of whipped cream in a decorative pattern, sprinkle with lemon zest. Chill several hours or overnight before serving. Custom treats from Cupcakes to Tart Citron! 1. Bring 1 cup sugar and ¼ cup water to a boil in a medium-size heavy saucepan, stirring until sugar dissolves. Cover and boil over medium-high heat, without stirring, 8 minutes or until golden, swirling pan occasionally. 2. Remove from heat, and gradually stir in whipping cream (mixture will bubble with addition of cream). 3. Add butter, honey, and salt, stirring until smooth. Stir in pecans; simmer over medium heat, stirring occasionally, 5 minutes. Remove from heat; cool completely. 9-inch removable bottom tart pan. Trim edges. Freeze crust 30 minutes. 5. Spread pecan mixture into crust. Unfold remaining piecrust, and roll into a 10-inch circle. Place crust over mixture, pressing into bottom crust to seal; trim edges. Sprinkle with 1 teaspoon sugar. Freeze 30 minutes. 6. Bake at 400 degrees F for 30 minutes. Cool on a wire rack. 7. Place chocolate in a small heavy-duty zip-top plastic bag; seal. Submerge in hot water until chocolate melts. Snip a tiny hole in 1 corner of bag; drizzle chocolate over tart. Sprinkle with remaining 1 teaspoon sugar. 1. Stir together all ingredients, and pour into freezer container of a 1-gallon electric freezer. 2. Freeze according to manufacturer’s instructions. Pack with additional ice and rock salt, and let stand 1 hour before serving. 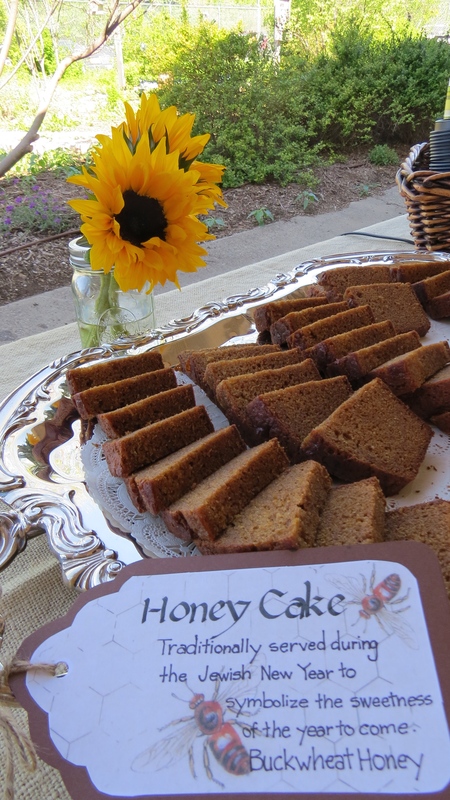 Posted in Herbs To Grow In Dallas, Recipe and tagged Honey Bees, Jewish Honey Cake, Recipes Using Honey. Bookmark the permalink. Why spend April 15 with a calculator, a pile of receipts, and a deadline? The Demonstration Garden was buzzing on tax day with more than 30 guests enjoying a packed morning learning all about bees and honey. Honey cake was delicious with hot coffee. 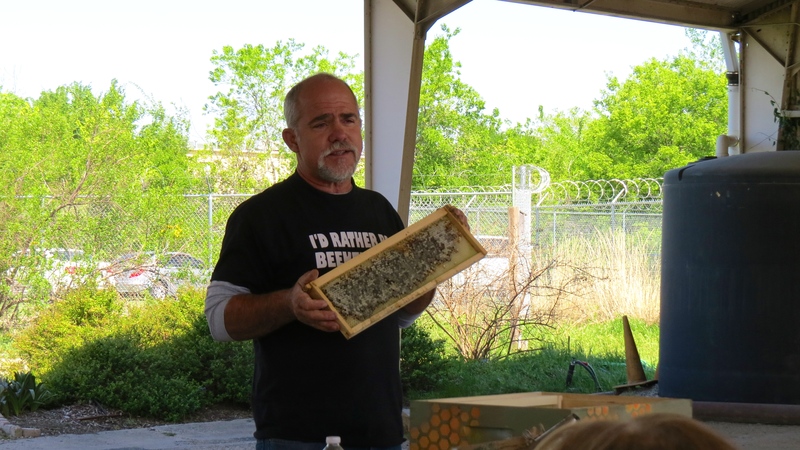 David harvests honey, of course, but his passion is the small insects that make it. He works to rescue bees from exterminators and to keep hives healthy. David shares information with other North Texan bee enthusiasts on the Facebook open group, CrossTimbers Beekeepers. (https://www.facebook.com/groups/CTBees/). Joe Field gardener (and beekeeper) Tim helped guests try different honeys with popsicle sticks. It’s hard to pick a favorite when testing Tupelo honey from Florida swamps, Sourwood from southern Appalachia, Orange Blossom from southern Florida, Wildflower from Texas fields, Huajillo from the brush country in Southwestern Texas, and Buckwheat from New York and North Dakota. Linda dazzled guests with an appetizer tray of Brie, Manchego, and Point Reyes Blue Cheese from Scardello, an artisan cheese store at 3511 Oak Lawn, scardellocheese.com. 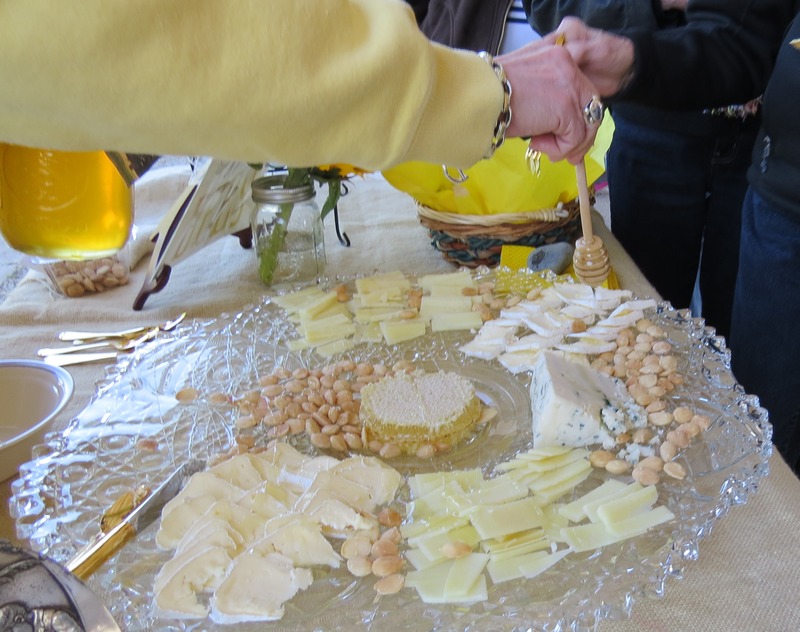 She sprinkled the cheese slices and honeycomb with Spanish Marcona Almonds, then drizzled the tray with honey from Master Gardener Jan Ramsey’s Tranquility Hill Ranch. 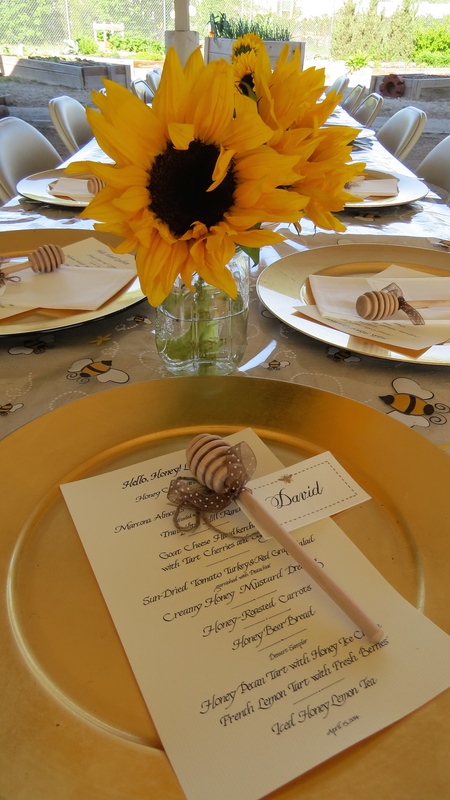 The table featured plates with tiny bees around the rim, bee-friendly bouquets of sunflowers, gold chargers, hand-lettered menus, and neutral tablecloths with a bee-themed runner. A place card with Elizabeth’s calligraphy tied to a honey dipper marked each guest’s place. Oh, did we mention lunch? The menu, of course, featured items with a honey twist: turkey and grape salad with honey-Dijon dressing, pasta handkerchiefs with tart cherry, sage (and honey) sauce, honey beer bread, honey-roasted carrots, and honey lemon tea. 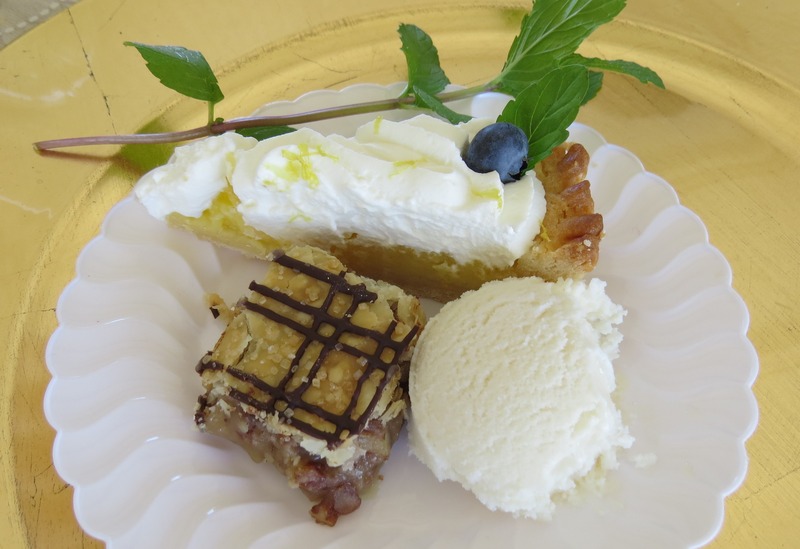 A dessert sampler tempted guests with a square of honey pecan tart, honey vanilla ice cream, and a French lemon tart topped with an abundance of whipped cream, a mint leaf, and fresh blueberry. Information from the national Honey Board, a list of bee-friendly flowers, and in-depth information and sources for each honey were given to each guest. 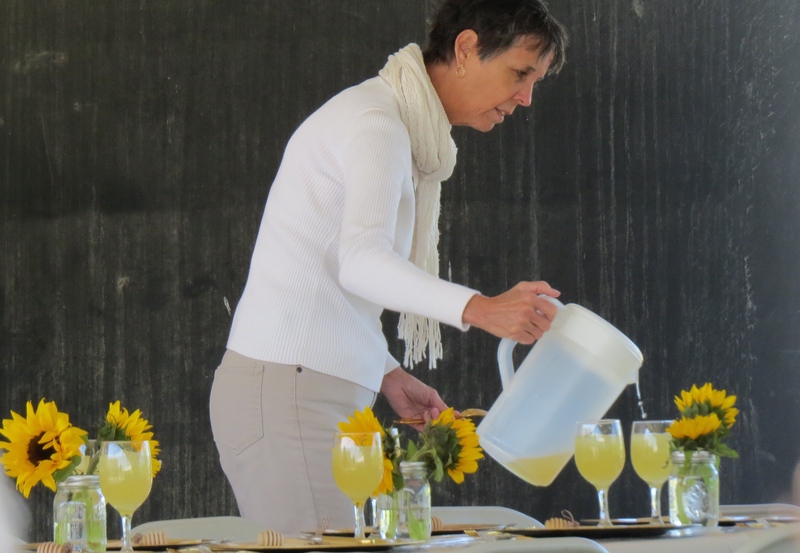 As we planned the event, we were amazed at the intricate and amazing world of bees and honey. We learned the difference between varietal (one source of nectar) and local honey (Texas Wildflower). One thing led to another, and soon we were ordering honey from across the South, visiting our local beekeeper at the farmers market, and purchasing honey on college visitation trips. Lisa purchased the Huajillo and Buckwheat honey from Walker Honey Farm, which has a retail store about 10 miles from I-35 in Rogers, Texas, near Belton and Temple. 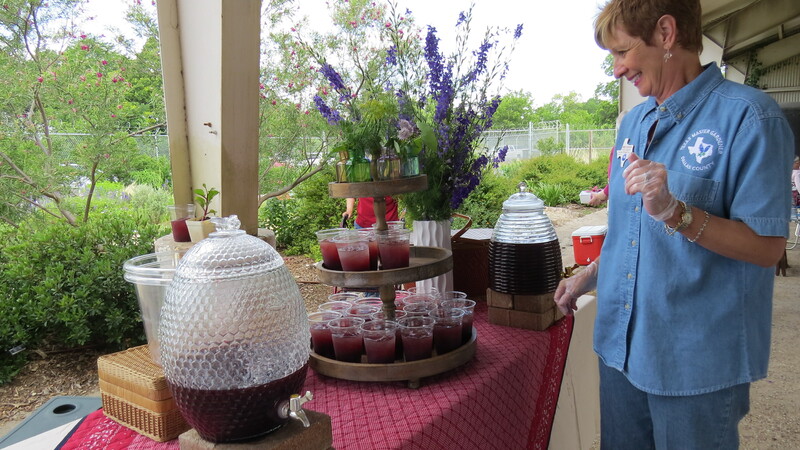 She also found a good selection of local honey at Ruibal’s Rosemeade Market in Carrollton, the HEB grocery stores in Georgetown and Temple, and the farmers market behind the famous Monument Cafe in Georgetown (a must stop if only for the homemade lemonade). Elizabeth made multiple trips to the farmers market on Campbell Road (near UTD) to purchase local honey and dippers from Warne Bee Farm in Anna, Texas. Linda explored cookbooks, magazines, and internet sources including L.L. Lanier, lltupelohoney.com, which has harvested Tupelo honey since 1898 in swamps along the Chipola and Apalachicola Rivers in Florida. She also found the Savannah Bee Co. of Savannah, Georgia, which sells the rare and wonderful Sourwood honey. Next time you’re at Bruce Miller Nursery on Belt Line Road in Richardson, check out Fain’s Honey from Llano, Texas. Lisa says Fain’s is a family favorite and something she and her family always pick up at Cooper’s Bar-B-Que in Llano after a big platter of brisket and ribs. Turns out there’s a honey of a family connection: Lisa’s dad, after all, was Fain Gibbons. 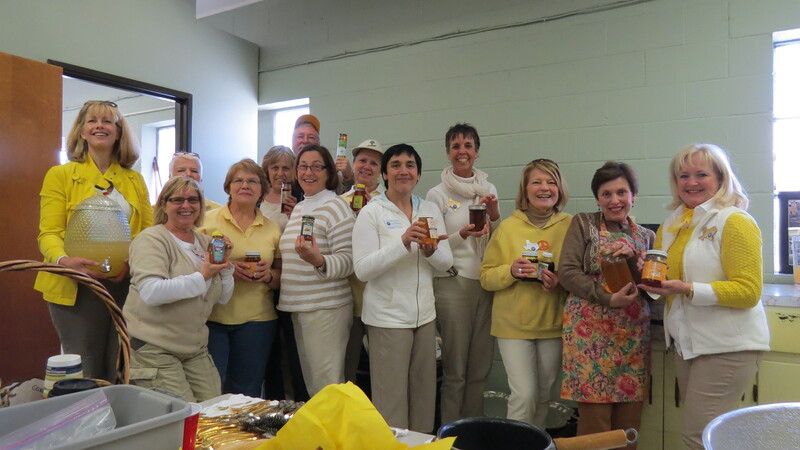 Recipes and more buzz about honey coming up in the next few days! Keep posted! 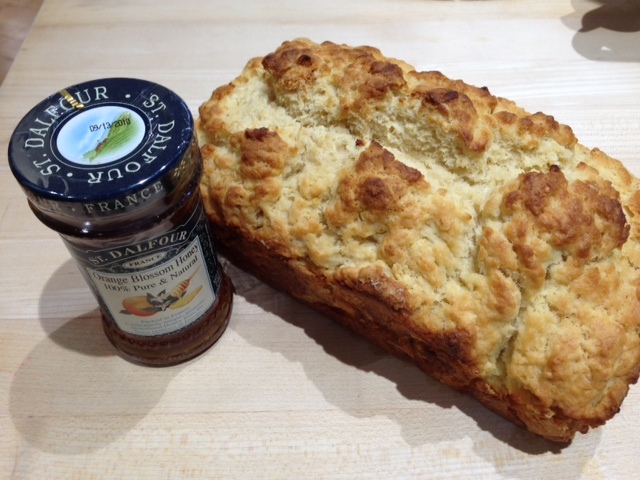 Posted in Herbs To Grow In Dallas, Insects, Recipe and tagged David McCarty, Honey Bees, Jewish Honey Cake, Local Honey Tastings, Recipes Using Honey, Tupelo honey. Bookmark the permalink. It is said that Monet was rather fond of them and planted them in the border of the pathway that led to the front door of his home in Giverny. With enchanting names like “Empress of India”, “Whirlybird”, “Alaska”, “Peach Melba” and “Butter Cream”, no wonder Nasturtiums are so welcomed in the garden. They just seem to add a touch of old-fashioned charm. Nothing signals spring’s arrival more dramatically than the first bunch of jeweled toned nasturtiums perched on the shelf at your local garden center. If you are looking for decorative, even water lily pad- like foliage, with a wave of brightly-colored blossoms that are tasty to boot, then head for the nasturtiums. You may be familiar with the varieties that have deep green leaves, but there are now a number of variegated, almost speckled ones, as well. Above: Lily pads in the garden? No, more fall Nasturtiums from Vermont! Ideally, nasturtiums like to be in full sun, with moist, well drained soil. However, most varieties can survive when grown in partial sun. These carefree little dazzlers don’t seem to be bothered much by snails, other insects or diseases. Enjoy them from March until sometime around late June when they succumb to our extreme Texas heat. You’ll typically find two different kinds of nasturtiums: dwarf bush type and trailing. The dwarf types are much more commonly available, and are useful as 10- to 12-inch tall colorful borders and for mass plantings. The trailing variety will cascade dramatically down walls or hanging baskets. 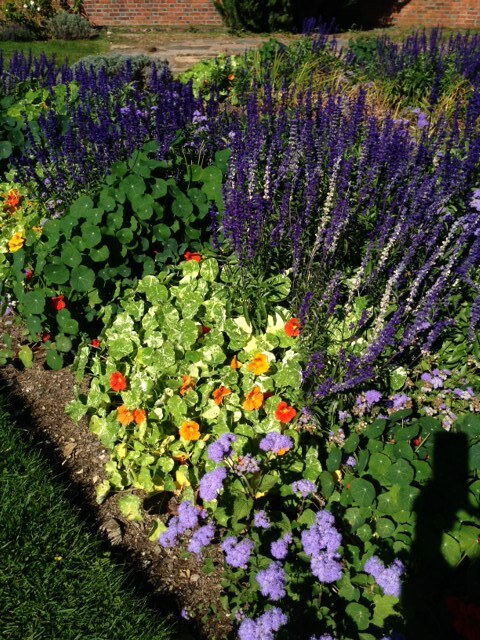 Nasturtiums make a lovely addition to the herb garden with a multitude of culinary benefits. There is nothing more intriguing than the tissue paper like profusion of blossoms that nasturtiums produce. Although the blossoms appear delicate, they are actually very durable and make for vibrant and long-lasting garnishes. Use the blossoms either whole or chopped to decorate creamy soups, salads, butters, cakes and platters. Their sweet, peppery taste (both in the leaves and in the flowers) adds to the enjoyment. Nasturtiums are natives to the cool highlands of mountains extending from Mexico to central Argentina and Chile. The conquistadors brought these brightly colored plants back to Spain in the 1500’s. The Indians of Peru used the leaves as a tea to treat coughs, colds and the flu, as well as menstrual and respiratory difficulties. Being high in vitamin C, nasturtiums act as a natural antibiotic, once used topically as a poultice for minor cuts and scratches. 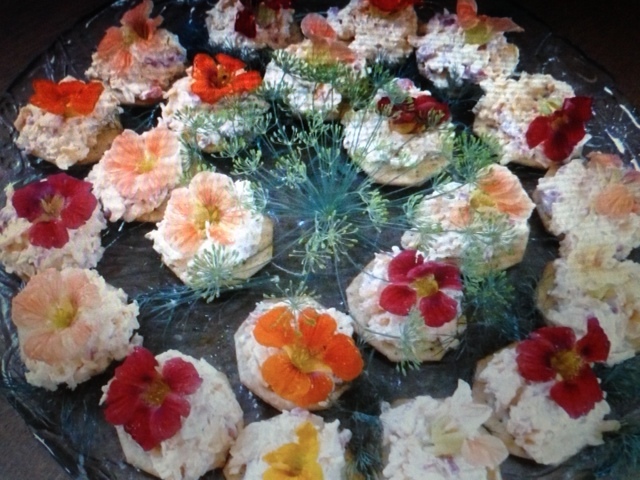 Take advantage of the many decorative ways to use nasturtium flowers for your next gathering. However, don’t be surprised; some people will turn up their noses to a beautiful flower sitting atop a cracker spread with herb-flavored cream cheese. Others will fully embrace the opportunity to sample such a tasty little gem. 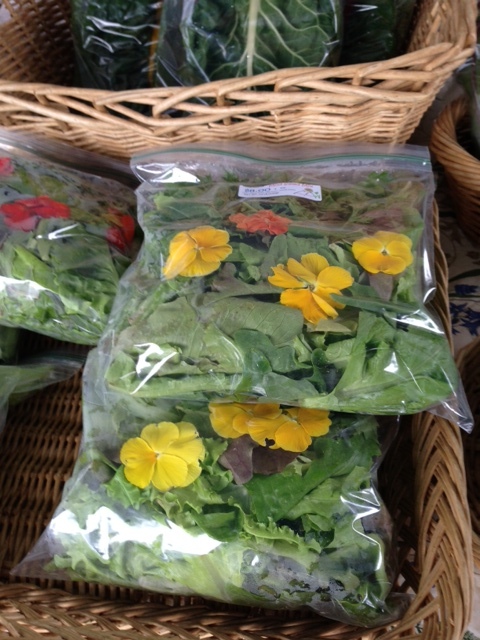 If we could only extend our growing season nasturtiums might grace our tables more often. Oh, dreaded Texas summers, why do you leave us so little time to enjoy this beloved plant? 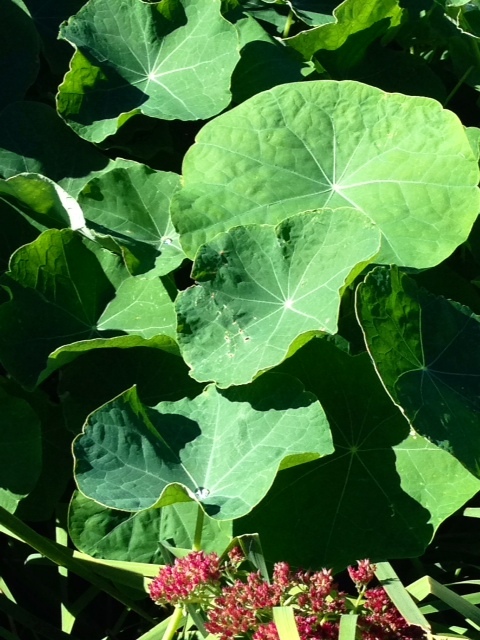 Tip: Texas AgriLife Extension Service recommends planting nasturtium seeds about the time of the average last frost. They are usually planted where they can be allowed to mature, since young seedlings can be difficult to transplant. Posted in Herbs To Grow In Dallas, Spring and tagged garden recipe, Herbs to Grow and Use in Dallas, Nasturtiums, spring blooms. Bookmark the permalink.